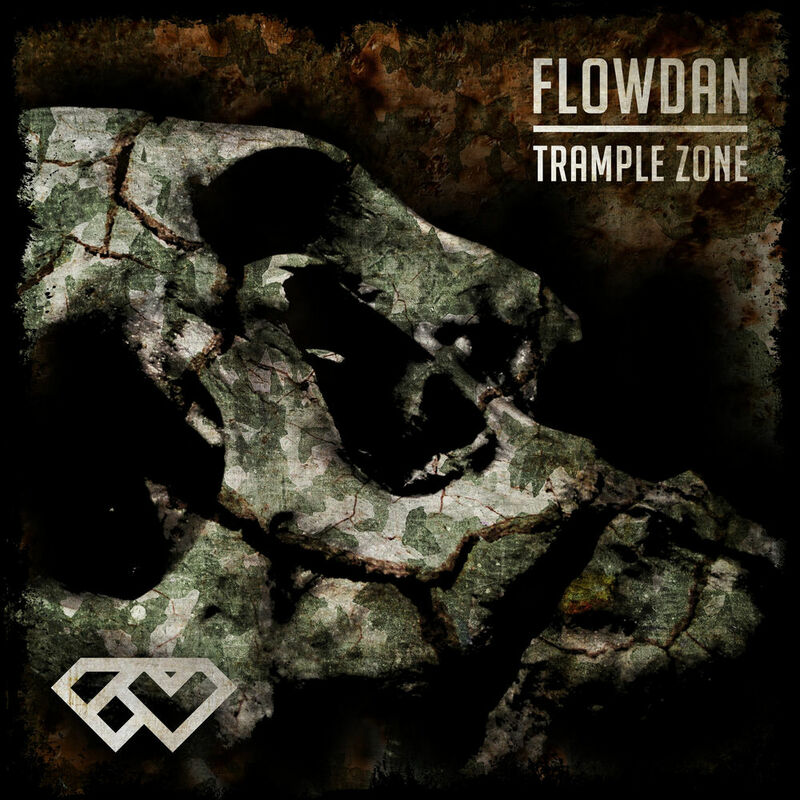 Flowdan returns with his first body of work in almost three years and the flow farda holds no bars in this fire project, aptly titled ‘Tramplezone’. Looking to body the competition and shell down, Flowdan has hit the target with this one. FR336IXTY and Dirty Cipher are here to take you through it track by track. The into starts with synth brass and string stabs before dropping into a heavy brass led beat with heavy kicks and skippy snares, the hi hats are constant and keep the high energy going, and there are vocal punches with bark like synths which all add to the weight of the track. Flowdan drops with “dem bloodclart dead tonight” and goes on to shell the instrumental with ease as expected, this one is for the moshers for sure. Packed with heavy artillery based wordplay and delivery, Flowdan spits that he can never run out of riddims, since he’s the “lyrical champion” these times using weapon based metaphor to describe shelling down the rave and murdering a sound boy. This one goes hard. Produced by Filthy Gears, the track starts with a detuned, panned siren effect, leading into a lazy 808 pattern with brass stabs, and the occasional skippy snare pattern. Flowdan comes in for war on this one, anyone can get it as he shows why he shouldn’t be challenged, I found this less of a mosh tune (not that all songs need to be) but dark, so would still go down hard in a live show. Flowdan shells 16s, left and right on this one, claiming his status as an OG shotter MC. Get ya screwfaces ready! Back 2 back, with GHSTLY XXVII, with Discarda on the chorus, again produced by Filthy Gears. This is a real skeng man war tune, with the MC’s riding a low subby bass, that has a sick rise at the end of the note, on the eighth bar you’re greeted by square bass stabs that compliment the tune nicely, the drums are a lazy dubstep esque - head nodding pattern, there are vocal accents, and the melody has a backwards, haunting quality to it but drops out completely occasionally. Discarda sits on Brass stabs and a vocal sample using “Shut up my yute” as the lead line in the chorus. Flowdan and GHSTLY XXVII spit back to back for the entire riddim about wastemen, with almost every bar starting ‘Run out’. Another sick tune, wavey. A skippy tune featuring Lyrical Strally, the intro is a nice simple synth pattern with a bubbly riser leading to the drop. The instrumental has a pizzicato violin melody with a square bass coming in every odd bar, and vocal synth accents. The drums are very skippy which blend with the MC’s flows perfectly, Lyrical content is as the title said Bars for Bars! The whole track is peppered with imagery for shelling opps, lyrically, and being at the top of the game, still, you will have to listen to this more than twice to catch everything!! A pacey riddim with an urgent tone, vibey. A synth brass kicks off the intro, which develops into the bassline with slightly less notes, a heavy kick, and skippy snare pattern, are peppered with vocal shout synths, and siren synths panning across the riddim occasionally, with drum breaks backed by brass stabs occasionally. Automatic is repeated on every second bar, which continues throughout the tune in the MC’s Bars, which features Jamakabi (a Grime legend). Both MC’s absolutely crush this tune with bars about being the baddest MCs, having the best of everything, being real G’s on the frontline that can’t be tested and being top kweffas in the ting. I would personally love to see them do this live so I can buss some heads in the pit!! A wheel up fr fr. Jheeeeze, man came to shell down the rave! Mission accomplished, cop it, cop the ting!